Autoimmune thyroid diseases, causing downregulation (Hashimoto disease) or upregulation of our thyroid function (Grave’s disease) are extremely common and affect over 10% of women and 2% of men. Studies indicate that genes contribute to 70% of these conditions—demonstrating a strong genetic predisposition toward autoimmune thyroid diseases. There are several environmental/nongenetic factors contributing to the development of autoimmune thyroid diseases including: stress, infections (for example, Yersinia enterocolitica and hepatitis C), drugs, alcohol (moderate alcohol consumption decreases the risk of thyroid diseases), cigarette smoking (smoking tobacco increases risk for Graves’ disease; but surprisingly, diminishes risk for Hashimoto’s thyroiditis), excessive consumption of carbohydrates and a vitamin D deficiency. Iodine is an essential trace element and a constituent of the thyroid hormones thyroxine (T4) and triiodothyronine (T3). The thyroid gland actively absorbs iodide from the blood to make and release the T3 and T4 hormones into the blood. 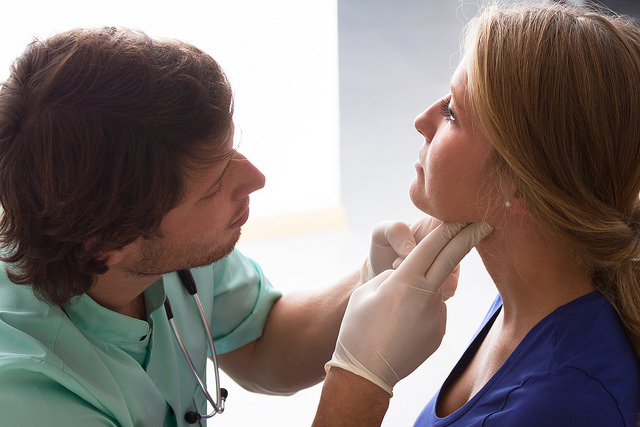 Significant iodine deficiency causes goiter and decreased thyroid function. Epidemiologic studies showed that excessive administration of iodine can contribute to the development of autoimmune thyroid disease in genetically prone individuals. Administration of iodine supplementation is appropriate in individuals with persistently low blood levels of iodine and decreased thyroid function. The optimal daily dose of iodine supplementation should be adjusted based on the level of iodine in your blood. Selenium plays a key role in the function of the thyroid gland, by serving as a cofactor (or helper) for three of the four thyroid hormone deiodinases that convert T4 to T3 (the active hormone). Clinical and experimental data show that selenium may inhibit Hashimoto’s disease and reduce autoantibodies (so-called anti-TPO antibodies) that attack the thyroid gland. In addition, selenium was shown to reduce eye involvement (known as ophthalmopathy) in patients with Grave’s disease. Excessive consumption of selenium can increase the risk of diabetes type 2; therefore, continuous use should be accompanied with blood work to monitor selenium levels and hemoglobin A1C (blood marker for diabetes). Inositol is a carbohydrate which plays an important role as the signal messenger in human cells. Thyroid function is controlled by the thyroid stimulating hormone (TSH). TSH mediates its function via inositol signaling pathways. Recently published clinical trials demonstrate that simultaneous administration of selenium and myo-inositol in patients with Hashimoto’s disease showed beneficial synergistic activity in the reduction of pathogenic autoantibodies and restoration of thyroid function (Nordio M, Pajalich R. Combined treatment with myo-inositol and selenium ensures euthyroidism in subclinical hypothyroidism patients with autoimmune thyroiditis. J Thyroid Res. 2013).